"This is an authentic, 'home-style' dish served in Taiwanese homes. You can vary the easy-to-buy ingredients however you want to yield as many servings as you want. Try adding a couple of tablespoons of whole kernel corn. Super easy to make, kids can do it too! Tender noodles coupled with subtle chicken broth, all with succulent pieces of chicken, exotic shitake mushrooms and a slow-simmered egg ... my favorite rainy-day meal!" Bring a large pot of water to a boil. Stir noodles into boiling water and cook until al dente, 8 to 10 minutes. (For a chewier texture, shock the noodles by pouring 1 cup cold water into the pot when it starts to foam, then letting it come to a boil again to finish cooking.) Drain and divide into two serving bowls. Meanwhile, bring chicken broth to boil in a medium saucepan with mushrooms and green onions. Cut chicken into bite-sized pieces and stir into boiling broth. When broth returns to a boil, crack eggs into broth. Continue to cook until chicken is no longer pink and eggs are cooked, about 10 minutes. 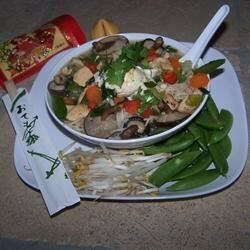 Pour the chicken soup over the noodles in the bowls and serve immediately. See how to make a savory, 5-star chicken noodle soup. This tasted great! It doesn't make too much though so I added more chicken broth. it's suitable for an Asian like me! Yummy! I really love this soup. Pefect for lunch and much heartier than it looks. I added snap peas to it and doubled the noodles, but it's great in it's original form too! Easy to make and delicious. I added a can of water and did not add any egg and it was delicious. Next time I might add some more vegetables, like cut up broccoli.